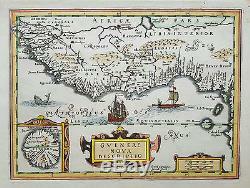 Rare and very decorative and attractive map of West Africa engraved by Direk Cornelissen Swardt. The map is almost identical to Direk Cornelissen Swardt's map for Cloppenburgh's edition of Mercator's Atlas Minor, except that the moiré pattern around the cartouche and the scale has been removed. This map without the moiré pattern is the same map as the one published in "Teatro Belgico, o vero Ritratti historici, chronologici, politici, e geografici, delle sette provincie unite" by the italian historian Gregorio Leti in 1690. All maps we have been able to locate from this work though, have text on the verso and the text "294 - Teatro Belgico" printed on the right border. Title: Gvineae Nova Descriptio Date: 1690. Size: 18.3 x 24.8 cm Verso: Blank. Authenticy: An authentic antique map printed at the date stated. We do not deal in reproductions or modern copies. The item just needs to be sent within 14 days of receipt, in original condition and safely packed. 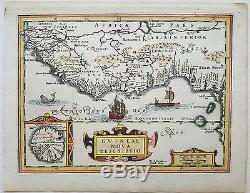 Rasmussen Antique Maps, Books & Prints VAT-NR: 38576593. The item "Original antique map of West Africa by Direk Cornelissen Swardt from 1690" is in sale since Friday, May 25, 2018. This item is in the category "Antiques\Maps, Atlases & Globes\Africa Maps".maps" and is located in Copenhagen.